raised $3,210 at Noche de Periodistas. 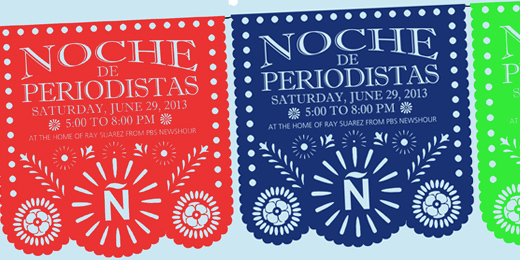 Thank you for making “Noche de Periodistas” a success! 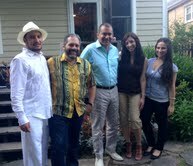 Mil gracias a Ray Suarez and his wife Carol for opening their home for a second year to host our chapter fundraiser. Gracias a Felix Contreras and his “Cilantro Boogie” band for keeping the beat going. Gracias a Suzanna Sanchez for designing the event’s logo, ticket, and poster. Thanks to our special guest Jim Avila from ABC News and his fiancé for joining us. Muchas gracias a todos who bought a ticket and brought a side dish. You made our fundraiser special and delicious! We raised $3,210 on Saturday night. The fund will benefit our national association and our Washington, D.C. Chapter. The revenue will be split as follows: $1,312.50 will go to the national level which is 70% of the profits from the following auction items: United Airline tickets and Excellence in Journalism convention registration. Our chapter will keep $1,897.50. This is more than enough money to replenish the checks we mailed for the two Charlie Ericksen Internship Supplements (commuter stipend for Washington Interns) and convention assistance (registration) for one professional and one student to attend the national convention in Anaheim. Before our fundraiser, the chapter had about $8,000 in our account. Suarez, Jim Avila, Jackie Diaz, and Melissa Macaya. 1 Response to ¡Mil Gracias!